Marcus Nasty should need little introduction to Grime AND UKF fans. 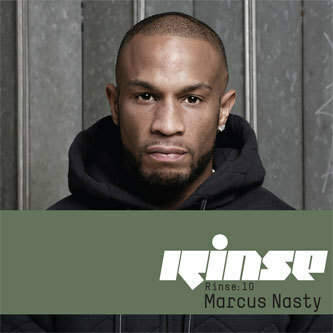 As head of N.A.S.T.Y crew (one of Grime's premier outfits naming Jammer, D Double E and Kano among their ranks) he was at the top of the grime game, but as a DJ his role was sidelined as riddims were made to suit the increasingly "clash-fuelled concert-like format" of the style. Ever ahead of the field, Marcus was one of the first Grime players to fully embrace the movement towards Afro-rhythmic and dancehall-influenced house music, a natural progression from the house inspired Garage music of the late 90's, also incorporating the subbass weight of dubstep. For the tenth Rinse Mix installment Marcus has rounded up the biggest underground, and overground anthems of the scene, giving a broad flavour of the depth and scope of UKF, rendering its influences from US house to electro and skanking dancehall. Expect tropical bangers from Lil Silva, Mad One, Crazy Cousins, Geeneus, Roska, Agent X, Altered Natives, and many more over the 29 tracks. Outside of radio sets you'll be hard pushed to find a better document of UKF's current status so we've gotta give this a massive recommendation to anyone following the hyper-prismic development of the 'ardcore continuum! BIG.